A while back I wrote about using LOGO as entry route for pupils into programming. I guess many of you have been thinking of ways of doing the same. 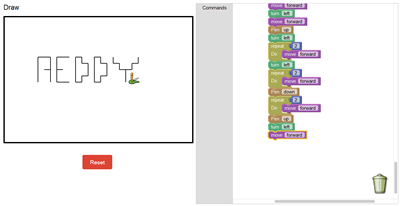 As if introducing programming and being a teacher wasn't already hard enough, David Wees decided to tweak the Blockly open-source code and turn it into a nifty fusion of LOGO's commands and Scratch's drag-and-snap coding environment. It's way better than anything I've seen in terms of entry into programming, for younger pupils in particular. What I like about it is that it's the perfect launchpad for LOGO proper or Scratch. David is a regular blogger with a good deal of good things to say. You can find him here. Thanks for the shout-out Bruno, much appreciated. I’m hoping to adapt it more this year, and add blocks for turns at a specific angle, and other Logo features. We will be using it again with our students this upcoming year and it would be nice to have the ability for students to go beyond simple blocks. What is also nice is that Blockly has more advanced blocks already created for logic, etc… so extending this to a full-on Logo implementation will actually be relatively easy. Looks like Brian and I both agree that specific angles would add something to it. You can see from my attempt at drawing R E D D Y that I would have used 45° and 60° (or probably 135° and 120° actually) quite a bit. Would you be kind enough to let me know if you do make those adaptations, including the extra logic commands? I would definitely use it with my year 7 class. And do you have any supporting documents that you gave to pupils in class that you could share, please? Neat! I tried it out and found it very simple to pick up and use. 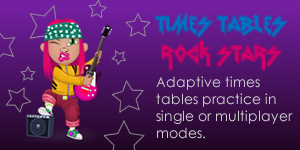 The drag-and-drop nature of the commands definitely makes this easy for younger students to get started quickly. The only thing I found lacking was the turns. Unless I missed it, you can only turn 90 degrees at a time, correct? I’d love for students to be able to program a greater variety of turns. However, I can see for a “starter” experience, this is still very robust. You will probably like this version of the Blockly language, created by the Google team, which includes all of the ideas you had concerns about (except how to save one’s work). I’m wrong, they have somehow managed to find a way to save work and even share it with others. Thanks David – this version of Blockly is awesome!